The first place that microbes enter is also one of the richest and most variable environments in the body. What are the most important species in my mouth? How much variability is there within the mouth? To find out, I took four samples immediately after waking up one morning. I was careful to swab only in a specific part of the mouth. While there is some variation in the cheeks, there is a dramatic difference between them and the lips or tongue. Also interesting is the way the lips are dominated by just three taxa that make up more than 85% of the total abundance. In Inverse Simpson terms, the lips are the least diverse, whereas the tongue is the most diverse. Let’s start with the genus level. How much Streptococcus has been in my mouth, and to the degree that we know at the species level, which types of species are there? 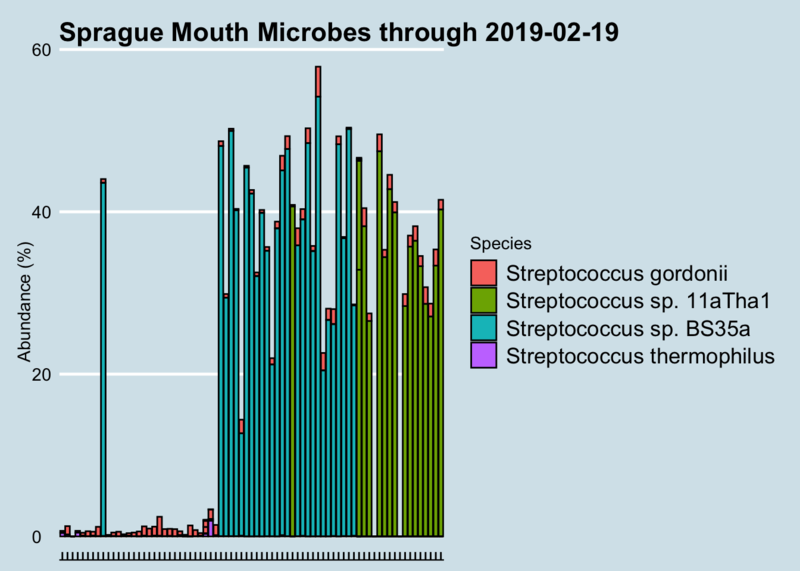 Here I find something alarming: a new type of Streptococcus appears to have colonized my mouth, somewhat suddenly, around April of this year. Streptococcus sp. BS35a seems to have been unknown to my mouth until then. Why? And is it really alarming? I’ve noticed no change in my health, dental or otherwise, and although I’m doing experiments all the time I can’t point to anything in particular that might have caused such a shift in that particular microbe. 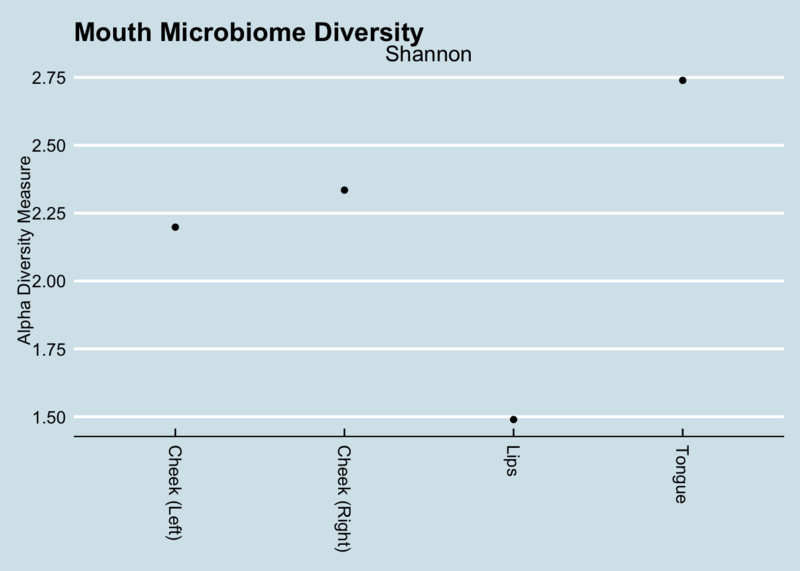 At the species level, I eliminated all samples with under 10,000 reads. We see something interesting: for no apparent reason, the species of Streptococcus detected in my mouth has changed. Suddenly, in December 2016 my mouth was colonized by a particular species that had not been there before. Why? I hadn’t done anything special; I’m not aware of any major lifestyle or other changes to cause this. I confirmed with the lab that it’s not contamination. What’s especially odd is that I experienced a shift like this twice now in one year. After comfortably floating along with Species Streptococcus sp. BS35a for more than six months, suddenly in August the balance shifted again, this time to Streptococcus sp. 11aTha1. Will it shift again? Who knows?